In his IFA 2018 keynote titled “The Ultimate Power of Mobile AI”, Huawei Consumer Business Group CEO Mr. Richard Yu introduced the Kirin 980, the system on a chip (SoC) that promises to bring about an evolution in mobile AI. As the world’s first commercial SoC manufactured with Taiwan Semiconductor Manufacturer Company’s (TSMC) 7nm process, Kirin 980 combines best-in-class performance, efficiency, connectivity features, and Dual NPU AI processing power. The cutting edge TSMC 7nm process technology enables Kirin 980 to pack 6.9 billion transistors within a 1cm2 die size, up by 1.6 times from the previous generation. 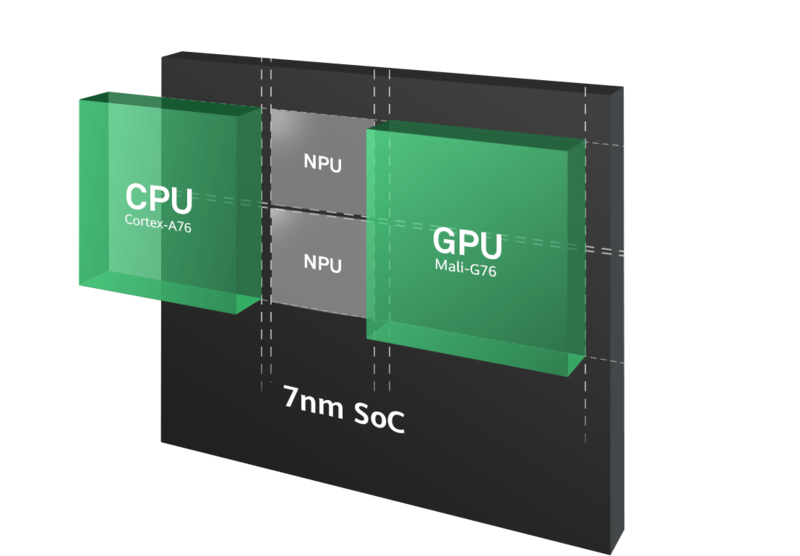 Compared to the 10nm process, the 7nm process delivers 20 percent improved SoC performance and 40 percent improved SoC efficiency. The Kirin 980 is also the first SoC to embed Cortex-A76 cores, which are 75 percent more powerful and 58 percent more efficient compared to their previous generation. In an octa-core configuration, the CPU in Kirin 980 is comprised of two high-performance Cortex-A76 cores; two high-efficiency Cortex-A76 cores; and two extreme efficiency Cortex-A55 cores. To take full advantage of this unique configuration, Huawei developed an innovative Kirin CPU subsystem with Flex-Scheduling technology that flexibly allocates the right cores to the right tasks. This solution designates the large high-performance cores to handle immediate, intensive workloads; the large, high-efficiency cores to provide sustained performance; and ultra-efficiency cores to tackle every day, light activities with extreme power efficiency. Running at higher clock speeds compared to the prior generation, Kirin 980 enables quicker app launch times, better multi-tasking and a generally smoother user experience. As graphics in mobile games have become more and more sophisticated in recent years, Huawei has integrated the Mali-G76 GPU into the Kirin 980 to deliver unparalleled gaming experiences. Debuting with the Kirin 980, Mali-G76 offers 46 percent greater graphics processing power at 178 percent improved power efficiency over the previous generation. Mali-G76 also features an innovative clock boosting technology that utilizes AI to intelligently identify gaming workloads and adjust resource allocation for optimal gaming performance. The latest Kirin SoC represents a new era of On-Device AI. The Dual NPU Kirin 980 elevates the On-Device AI experience with greater processing power and intelligence. The synergy between the Dual NPU results in an image recognition capability that is greater than the sum of two—the Kirin 980 can recognize up to 4,600 images per minute, up 120 percent compared to Kirin 970, further demonstrating Huawei’s industry leadership in the On-Device AI space. Additionally, Kirin 980 supports common AI frameworks such as Caffee, Tensorflow and Tensorflow Lite, and provides a suite of tools that simplifies the difficulty of engineering On-Device AI, allowing developers to easily tap into the leading processing power of the Dual NPU. In pursuit of the best smartphone photography experience, Huawei integrated its proprietary fourth-generation ISP into the SoC. In addition to a 46 percent increase in data throughput compared to its predecessor, the new ISP also provides better support for multi-camera configurations, as well as an all-new HDR color reproduction technology that can manipulate picture contrast to highlight objects on various parts of an image. In addition, Kirin 980 utilizes the Multi-pass noise reduction solution that accurately removes artifacts without scrubbing away image details, resulting in better quality on images taken in low-light scenarios. Another new feature of the ISP is improved motion tracking. When a user attempts to snap a photo of a moving person, the ISP can still recognize the subject with 97.4 percent accuracy, so any user can capture fleeting moments with ease. The rise of video-centric social media platforms brought together with it a surge of demand for video capture features. Kirin 980 adopts a new pipeline dedicated to processing video captures, allowing the camera module to shoot videos with 33 percent shorter delay.